From September 4 to 7, the 10th Anniversary International Forum "Lubricants. 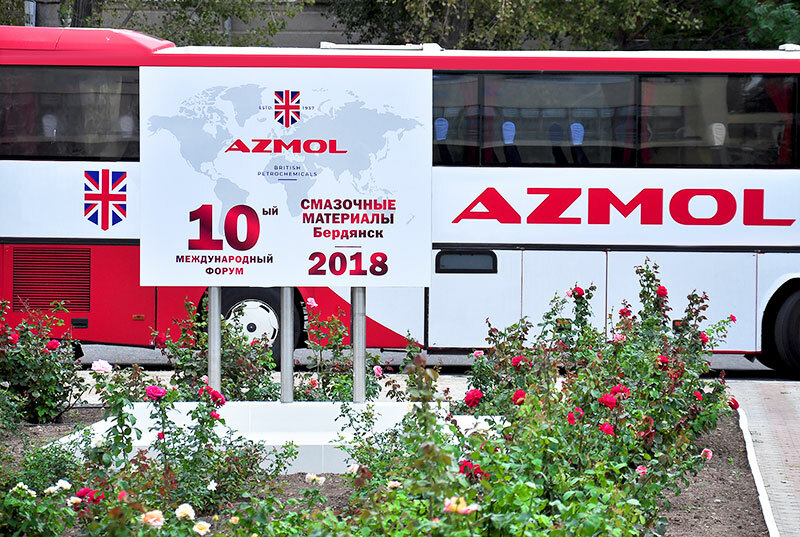 Berdyansk-2018 " was held on the basis of the Ukrainian-British joint venture AZMOL-British Petrochemicals. 160 delegates from 12 countries took part in the forum. The event was opened by the organizer of the forum, the founder and investor of AZMOL-British Petrochemicals, president of the European Lubricating grease Institute, Terry Dicken. "The main goal of the forum is to provide information to our customers about the new AZMOL-BP, about its new capabilities, about the new products of world-class quality, which are manufactured today at our enterprise. With this forum we demonstrate our openness to our partners and look forward to the growth of their trust in our company and its products, " Terry Dicken addressed in his speech to the forum participants. The emphasis on the new AZMOL and new opportunities of the company was made by all the speakers of the forum. Several years ago the Berdiansky plant AZMOL, which has a large production history and fame in world markets and which has passed in modern Ukraine from reduction of production to complete stagnation of the enterprise, received European owners. Today, AZMOL-British Petrochemicals continues global reconstruction and increases production. The strategy of AZMOL-BP is aimed at ensuring that the products take their place among the best global brands in foreign markets. And in Ukraine the enterprise has already begun to implement import substitution programs. As part of the forum, Terry Dicken gave a tour around the plant, during which he demonstrated the technical potential of the enterprise and announced plans for the development of the assortment line. Deliveries of raw materials for the production of oils and lubricants at AZMOL-BP are performed by well-known world manufacturers of base oils - the Swedish company Nynas, as well as the well-known companies Chevron and Neste Oil. High-quality raw materials, modern production technologies, cooperation with international laboratories are the advantages that allow AZMOL-BP to obtain the tolerances of the world's auto manufacturers and equipment manufacturers. So well-known auto-building concern "Daimler" officially included lubricants of AZMOL-British Petrochemicals in the list of recommended brands for servicing cars "Mercedes-Benz". The same recommendations will be received in the near future from Volkswagen and Renault. The trust of such brands as "Mercedes-Benz" is an important factor for the reputation of any lubricant manufacturer, and for AZMOL it is also the restoration of positions on the world market. In Soviet times, the company produced oils and lubricants for the entire automotive industry of the USSR and for some foreign manufacturers, for example, the Italian Fiat. And in 1993 the Berdyansk plant AZMOL received a license from the British company Castrol for the production of Castrol marine oils. Contemporary modernized AZMOL-BP has ambitions to revive cooperation with the world leader and negotiations with Castrol are already underway. "AZMOL-British Petrochemicals is a large enterprise with talented and highly qualified people working! This allows us to develop and implement the production of new modern lubricants that meet all the requirements of the world market. And we are not going to stop! " shared further plans of AZMOL-BP its founder and investor, Terry Dicken.